The Hotel Danubia Gate, Bratislava has not only won a Certificate of Excellence three times in a row, it's also ranked as the #1 hotel in Bratislava on TripAdvisor! This is an impressive achievement and it's obvious why they're ranked so highly: the Hotel Danubia Gate is in the perfect location, the breakfast is delicious, they have whirlpool baths and the welcome and service are impeccable. We had one of the best check-ins we've ever experienced, the receptionist was very friendly and welcoming. She gave us a map and even let us borrow a guide book of Slovakia. She also told us that we'd chosen to visit at the perfect time, because Slovakia was celebrating the 275th anniversary of the coronation of Queen Maria Theresa! So there were lots of cool things going on in the city, like wine tasting, traditional music and a craft fair. 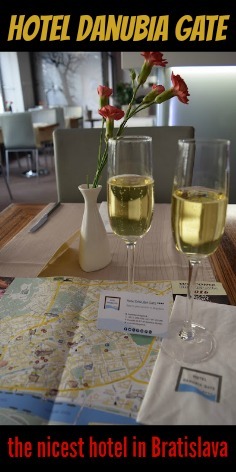 We were also treated to welcome drink of champagne which was a really nice surprise. We often receive a welcome drink, but it's never been champagne before (our favourite drink). It was great to be able to toast a new country (Slovakia). We also received a delicious fruit platter. The fruit was really fresh and it was a really nice touch. We were in a DeLuxe room, which had not one, not two, but THREE televisions! One in the sitting room, one above the bed, and one in the bathroom. Talking of the bathroom, it had an excellent whirlpool bath! It was super relaxing and big enough for two. There were also candles, mood lighting and an extensive selection of toiletries including bath salts! As for our bed, it was one of the comfiest we've ever slept in. We had an early bus to catch the next morning, and usually in this case I sleep kind of restlessly, but it was impossible to do so here, not only was the bed very comfy, the curtains were very thick making the room nice and dark. Furthermore, The Danubia Gate offer a pillow menu - you can choose from a standard, an orthodontic, a memory foam or even an orthodontic memory foam pillow! We also had a sofa and chairs in our room, and a desk - it was more like a studio flat than a room! There was even a computer, a sound system and, perhaps most importantly: a printer. We also had chocolates on the pillow! Perhaps it's because we've spent most of this year in SE Asia (where it's too hot for pillow chocolate), but we haven't had a chocolate on our pillow in any other hotel! The Danubia Gate also offer wi-fi throughout the hotel which we found really fast - quick enough to even upload our daily YouTube video (see below). They also have a 24 hour fitness centre, we unfortunately didn't get a chance to try it out, but we were impressed that it was available 24 hours. This should be a must in all hotels with a gym. The Danubia Gate is also ecologically aware, which is something close to our hearts. They are an official member of the International Ecotourism Society. Breakfast was much better than your average hotel buffet breakfast, they had all the usuals like: breads, toast, cereals, cooked eggs, sausages, cold meats, jams and marmalade. But additionally they had: sun-dried tomatoes, Slovakian cheeses, fresh fruit and cooked Mediterranean vegetables. 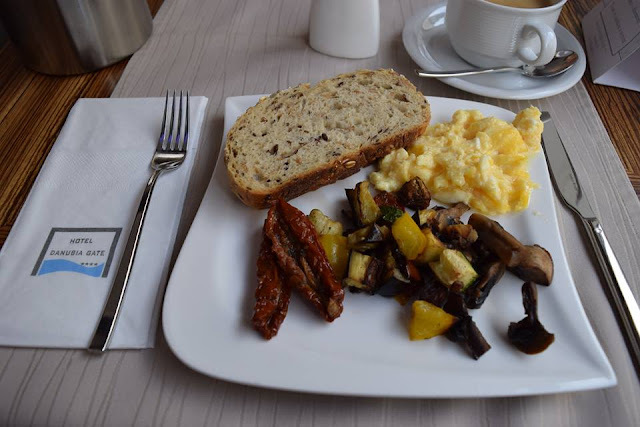 We were very impressed by the breakfast selection, it was yummy, there was something for every taste/diet and there were lots of delicious things we didn't expect to see. We were able to explore almost all of the hot spots of Bratislava using the Hotel Danubia Gate as our base, so it was perfect for seeing the sites. However, it was also perfect for getting a good night's sleep as it wasn't in a rowdy location. We really, really enjoyed our stay at the Danubia Gate Hotel, the room, the breakfast and the location were all excellent, but the staff and the whirlpool really made it perfect. To make your own booking head onto their website www.danubiagate.sk/en/ or book through TripAdvisor. Also make sure to follow them on Facebook and Twitter. Disclaimer: Travelling Weasels were invited as guests of the Hotel Danubia Gate, but as always all opinions are our own.